AW Health Care is Medicare- and Medicaid-certified with licenses in both Missouri and Illinois. AW has contracts with many insurance companies. We help clients and families secure the right funding to cover the cost of important care. Look at the chart below. You may not see your insurance company listed. There are many private and government insurance companies and we cannot list all. Please call us at 314-330-7992 to speak with one of our Senior Care Consultants for more information on coverage. In most cases, home health care is covered 100% by Medicare. AW Health Care is Medicare-certified. 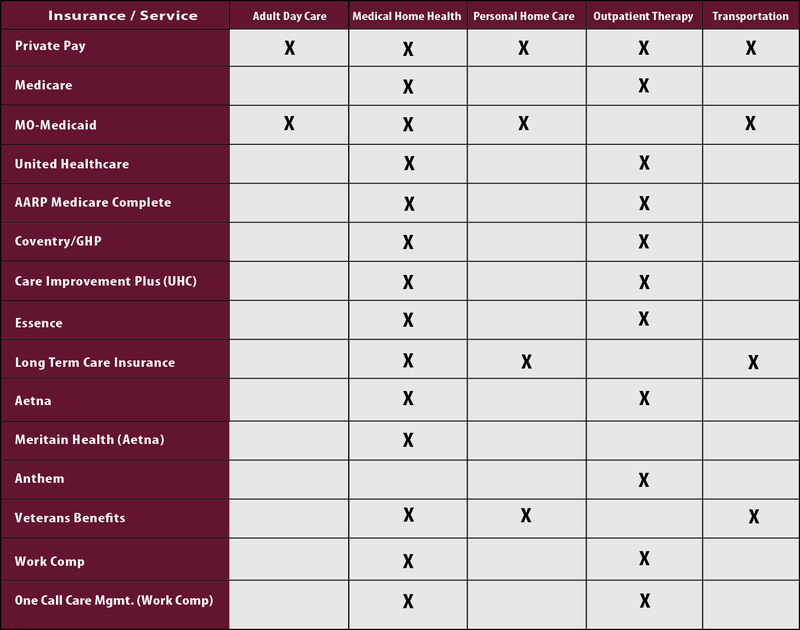 We also have contracts with many Medicare Advantage plans such as UHC or AARP Medicare Complete. Many private insurance plans also cover home health. We can help you check your benefits for coverage. WHO PAYS FOR PERSONAL CARE? AW Health Care provides personal care services in the home that are covered by Medicaid and some long-term insurance plans. If your loved one is a veteran or the surviving spouse of a veteran who served in a foreign war, there may be resources available to help cover the costs of personal care in the home. We will exhaust all resources to help you meet the needs of your loved one.